Here's one not-my-usual-kind-of-thing post where I'm wearing a kewl sequined and destroyed top from Replay and white shorts with white studs. 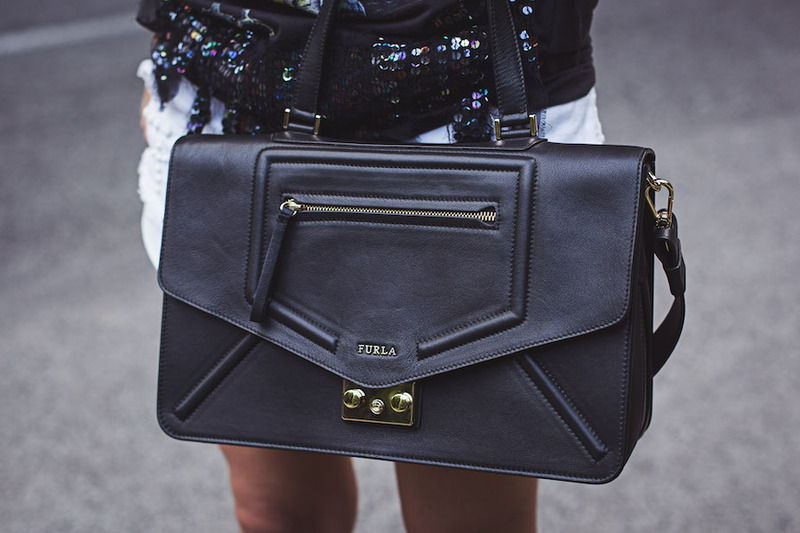 I wore it all with studded killer heels by Loriblu which I matched with this cute Furla bag. Sunnies are Stella McCartney. Yeah it's not my thing so much rock n roll but I felt like it would be cool to post something different. I got it all in Roses Fashion Outlet for a really affordable price. Super mi je što na tebi svaki stil djeluje urbano i ukusno,na većini cura ovakav tip sandali na petu i šorc bi stajalo vulgarno.Svi bi rekli da je to zato što si manekenski tip građe,al nije samo to,vidim na tone mršavih cura kako se prešetavaju u takvim štiklama i šorcu i izgledaju kao da su izišle iz neke zadnje narodnjačke rupe. Ti si baš inspiracija za sve koje žele poboljšat svoj stil. I love everything in this post, Isabella! You are gorgeous as always….the Stella sunnies look so good with this outfit!! Love your hair and these photos are gorgeous! Really love this simple but pretty shirt!